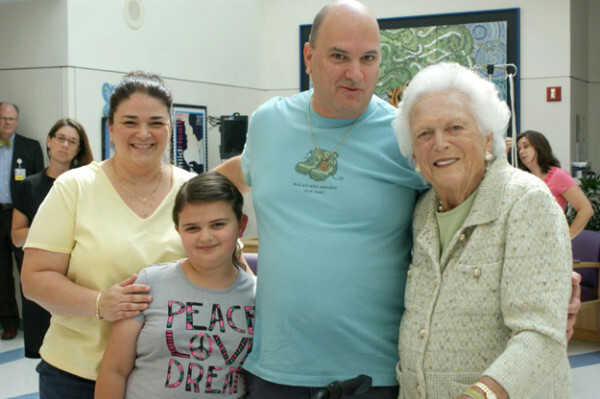 The Westrich family, from left, Kim, Madison, and Joe, poses with former first lady Barbara Bush. A mock-up of a charity license plate to benefit The Barbara Bush Children's Hospital. 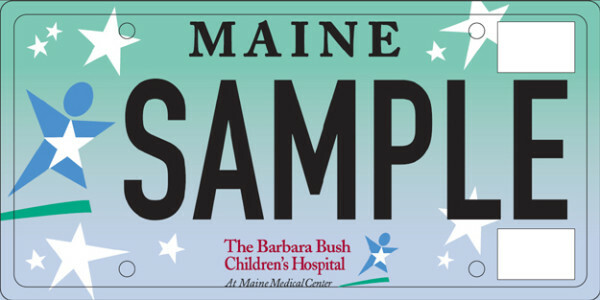 WISCASSET, Maine — A Wiscasset family whose daughter was helped by The Barbara Bush Children’s Hospital wanted to give back, and so they teamed up with the hospital’s director of special and annual giving to develop a new charity license plate. Madison Westrich, daughter of Joe and Kim Westrich, was diagnosed with a brain tumor in February 2008, shortly before her third birthday. After enduring neck pain and nausea and several visits to doctors, an MRI at The Barbara Bush Children’s Hospital in Portland revealed Madison had a juvenile pilocytic astrocytoma brain tumor, Joe said. Juvenile pilocytic astrocytomas generally form cysts or can be enclosed within cysts, and though they are usually slow growing can still become very large, according to the American Brain Tumor Association. Two days after Madison was admitted, the tumor was removed and found to be non-cancerous. She came home a week later, but had to go back for another 11 days after she developed a buildup of fluid in the brain and needed it drained, Joe said. After a regular but diminishing schedule of MRIs each year, doctors later found scar tissue had formed over Madison’s original surgery site and was impeding her spinal fluid, Joe said. Doctors created a new pathway for the fluid to flow last July. Throughout all this, Madison experienced no side effects, Joe said. During Madison’s treatment, Joe said she was always the healthiest child there, which was very humbling. Across the hall, one child could only be held by his or her parents for 20 seconds a day, he said. Madison has regularly donated toys to the playroom at the hospital, Joe said, and last December the family reached out to friends on Facebook to garner more donations. Juggling jobs and the time and expense to travel to Boston regularly would have been difficult, he said. “That expense adds up, so we’re very fortunate to have Barbara Bush Children’s Hospital in the state of Maine,” Joe said. Working on creating a specialty license plate seemed to be a good fit for the family as another way to give back, according to Joe. He works as a supervisor for Lincoln County Communications Center, and Kim works as a child witness advocate for the Lincoln and Sagadahoc counties district attorneys’ offices. “There’s not a lot of money in public safety; I can’t write that big check out,” he said. Together Joe, Kim, and Madison have been working with Matt Parks, the hospital’s director of special and annual giving, to make it all happen. The campaign for the new specialty plate kicked off on April 14. The proposal outlines a variety of activities planned to support the campaign, including visiting hundreds of stores around the state hits year to identify “champions,” or point persons, for the effort as well as distributing posters and registration packets. Before the secretary of state can manufacture a specialty plate, a sponsor must provide a list of 2,000 supporters’ signatures declaring an intent to purchase and display the plate and $25 from each supporter, and specialty plate legislation must be approved by Legislature, among other requirements. The secretary of state is required to give each of the supporters credit receipts for $25 for use in obtaining their specialty plate. The $50,000 raised from the initial 2,000 supporters goes into a plate fund to cover costs of producing and stocking bureau of motor vehicles branches and town offices with the plate, according to Director of Vehicle Services Garry Hinkley. Any funds left over from the $50,000 would benefit the hospital. According to the hospital’s proposal, subsequent new plates would cost $20 (in addition to the regular motor vehicle registration fee) and $15 for a renewal. $10 of each of those plate fees would benefit The Barbara Bush Children’s Hospital. For more information, visit www.bbch.org/licenseplate, or contact Matt Parks at parksm@mmc.org or 662-6111. Online or mail-in registration is available.